Hakkında: Share Album is a piwigo plugin to enable albums share via a simple URL. 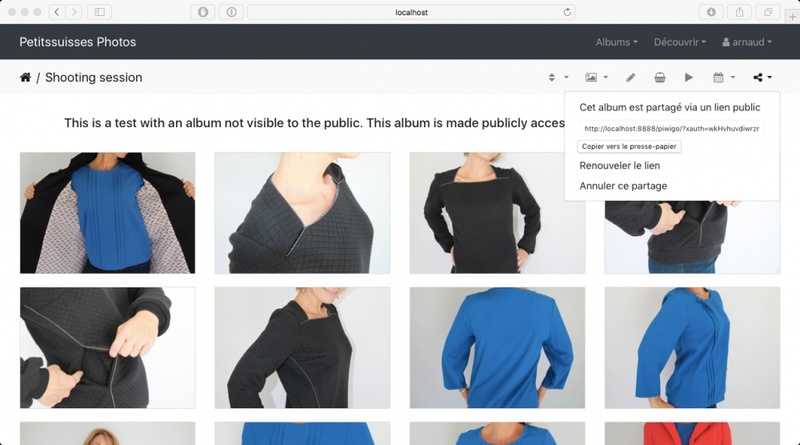 For any private album, you can generate a unique URL that you can share with the users you trust in enough to browse an album. Use the new Share function available on private albums (for administrator users only). Fixed a few discovered issues and implemented new features. Please renew all existing shared albums codes in case of update. Fixed package which incorrectly deployed in previous version. From each private album, there's a new "Share" sub menu displayed on the category (album) page. From this menu, you can share this album. One shared, you are provided with a unique http(s) link giving access to this album.